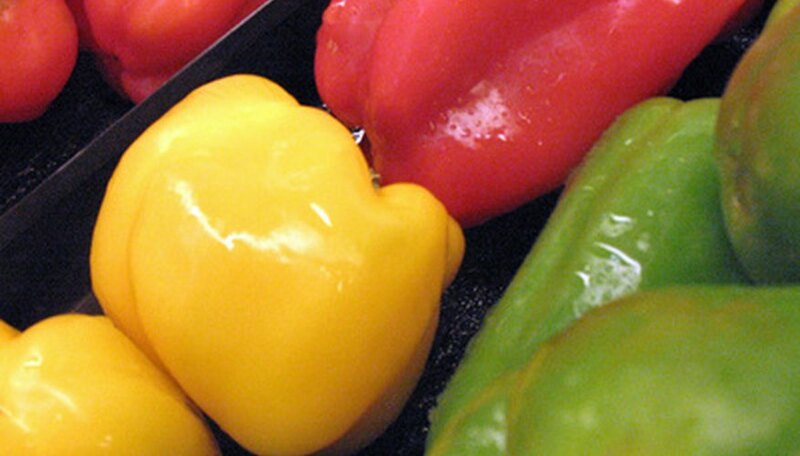 Peppers make a wonderful addition to numerous food dishes, and are found in kitchen gardens everywhere. There are as many different types of peppers as there are tastes in cuisine: red, green, yellow, hot and sweet peppers, and the list goes on. Raising your own peppers has several benefits, from saving money to avoiding the use of harsh pesticides and fertilizers. Unless you live in a warm climate in the Deep South, you will have to start your pepper seeds indoors. Start your pepper seeds eight weeks before the last expected frost date in your area. If you are unsure of when that may be, contact your local county cooperative extension or ask an established gardener. Set the seed pots in the large seed tray, and fill the plastic seed pots with the seed starter mix, stopping 1/4 inch from the top. Water the soil in the pots until it is moist but not drenched. Insert your pepper seeds 1/4 inch deep, three per pot, into the soil and cover them. Place the plastic dome over the tray--if you don't have a dome, you can use a sheet of clear plastic wrap. The dome gives the seeds a greenhouse effect, which helps keep moisture and heat in and promotes germination. Prepare a stand for the seed tray in a bright, sunny window. Lay a kitchen towel on a cookie sheet that you have placed on the stand, and then lay a household heating pad on the towel. Place another towel on top of the pad, and then set your seed tray on the very top. Turn the heating pad to medium. Peppers need warm soil to germinate, so leave the heating pad on during the day and turn it off at night. You can also purchase special seed heat mats from a lawn and garden center. Monitor the moisture content of the soil as you wait for the seedlings to emerge. If the soil feels dry, water from the bottom by putting the water into the seed tray, rather than pouring it on top. Remove the plastic wrap as seedlings emerge. Germination can take place anywhere from three days to three weeks, depending upon which type of pepper you are starting. Discontinue the use of the heating pad one week after germination. Cut off the weakest pepper seedling in each pot at soil level as they develop their first set of leaves. Repeat this step as they develop their second set. At this point, you should only have one pepper seedling per pot. Continue to monitor the moisture content of the soil as the seedlings grow, keeping them moist but not too wet. Harden your seedlings off one week before planting them into the ground by setting them outside in a sunny location that is protected from wind during the day and bringing them inside at night. Plant in the garden, spacing the plants 18 inches apart in rows that are 24 inches apart. Use black plastic mulch around the base of the plants when you plant them in the garden. This will help keep warm soil around the roots. Peppers need warm soil temperatures in order to grow. If the daytime temperatures do not average 75 degrees F, growth can be affected.